Create a contemporary look in your casual dining area with this five piece pub table set. 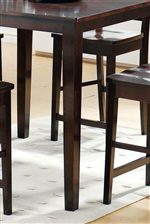 It features a 36 inch height pub table with clean and smooth edges and solids legs. Four pub chairs are paired with the table with a 24 inch seat height. The chairs features a box seat and X-back design. 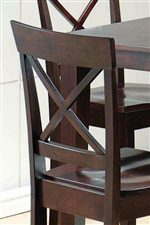 Finished in a warm, dark espresso wood finish, this pub table and chair set will correlate with any home decor. This pub table and chair set would be the perfect addition in your casual dining area, kitchen or porch. It can be a breakfast table, card game table or drinks and appetizer table for your home. The Cobalt 5-Piece Casual Counter Height Table & X-Back Chair Set by Steve Silver at Walker's Furniture in the Spokane, Kennewick, Tri-Cities, Wenatchee, Coeur D’Alene, Yakima, Walla Walla, Umatilla, Moses Lake area. Product availability may vary. Contact us for the most current availability on this product. Finish Dark espresso wood finish. Case Detail Straight table legs, box seats, X-back on chairs. Smooth and clean lines. Description: Top Solid finished wood top. Case Construction Constructed from hardwood maple solids. These five piece table collections provide a functional and lasting seating group in the dining room in your home. A cross-back chair design with straight tapered legs and clean, geometric lines comes together to provide you with the gathering area you desire, in three warm and enticing finishes. Complete the seating area in your kitchen, dining room, or home bar today with the Cobalt collection. The Cobalt collection is a great option if you are looking for Casual furniture in the Spokane, Kennewick, Tri-Cities, Wenatchee, Coeur D’Alene, Yakima, Walla Walla, Umatilla, Moses Lake area.